Paver cleaning can be very labour intensive. The very rough nature of pavers is such that not only do you have a porous material but to compound the matter you also have joints at every edge allowing the ingress of all sort of debris including water. This creates a perfect environment for the germination of not only algae but weeds completely ruining the appearance of your beautiful paved driveway or entertaining area. If you haven’t ever tried to clean pavers before, then make sure you get the proper pressure cleaning equipment and treatment for paver cleaning. If you don’t, you will quickly find out that non-commercial pressure cleaners won’t remove built-up dirt and grime or those awful weeds very well and if you don’t use a special treatment in conjunction with the pressure cleaning process you will find that the moss, algae and weeds will return almost right before your eyes. Also the work rate of small pressure cleaners will have you there for days chewing up your precious weekends. 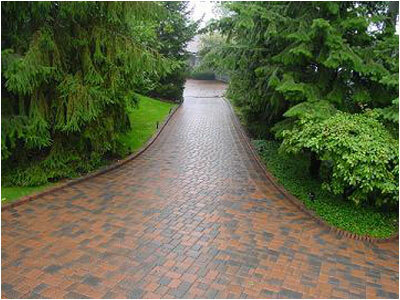 This is where professional paver cleaners and equipment make the difference and make it easy to achieve great results. Don’t waste your time trying to get the results only a professional like Power Wash Australia can achieve. We have all the gear and the experience to make your paving come to life once again. New brick work usually needs to be brick cleaned at some stage after being laid. The sooner the bricks are cleaned the easier the brick cleaning process is. Hydrochloric acid is used in this process to break down cement mortar residue left by the brick laying process. Some brick layers are messy and leave large amounts of cement all over the new bricks making the brick cleaning process very tedious and time consuming. Some brick layers also use to much cement in the mortar mix making the mortar way to hard which also makes the cleaning process difficult. Inexperienced brick cleaning contractors can burn the bricks “leaving them yellow” if there knowledge of light coloured bricks particularly is limited. Brick cleaning is tricky and choosing the wrong contractor can be fatal for the appearance of your home. PWA is experienced in all aspects of pressure cleaning including the cleaning of newly laid bricks. Choose Power Wash Australia if you would like your new bricks to look the way they should. Call us today on 0415 972 645 or get an online quote for quality driveway cleaning in Sydney. Ask us about information on penetrating sealer for specialty pavers.